Today when we went over long division Math U See style for the 3rd time and Reia ended up in tears, I knew we had a problem. I did what any normal homeschooling mom who wanted to make something stick in her kid's brain would do. I googled "how to teach long division". After all, I KNOW how to do long division, but explaining that to someone in a systematic way is different. After I studied a new "method", which was DUH, so easy I felt like an idiot, we set to work. After lots of hugs and support from me, within minutes the light bulb went on. And the long division boogey man was gone. And trust me, he was terrifying all of us. What is the point of this post? I don't know how parents home schooled before google. =) Ok, that's only part of it. The larger part is that there is more than one way to skin a cat (google "figurative language" on that). Our children are all different! Don't be so stuck on one way to do things that you are miserable, or worse, they are, for an entire year. I'm trying to figure out the easiest way to upload pics to my blog. And as a side note: this was the garden on May 3rd right after Terry built the newest three beds and before they were full of fabulous dirt and seeds! Sorry. I don't look terribly lovely while building a garden bed. It's hard work, the soil mix stinks like crazy, but hopefully in a few weeks the kids will see their individual squares (not shown here) start having little seedlings popping their heads up out of the dirt. After we prepared this bed, I took twine and sectioned off the bed into eight parts. Each child in our family, the Russell family and the neighbors that live on the other side got to choose and square and plant whatever they wanted. We also printed off garden journals today. We will be listing what each child has planted, the date, and weekly reports as to what is happening with each squared off portion. I think it will be fun for the kids and hopefully get them engaged in where their food comes from and how it's produced. 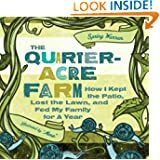 Book Review: "The Quarter Acre Farm"
My basis for a good book on gardening is the following: I learn something I didn't know before reading the book while being entertained at the same time. This book fit the bill. The author takes a look back at her first year or so of gardening on her quarter acre lot in town. And as the whole title reads, she "Kept the Patio, Lost the Lawn, and Fed My Family for a Year". A wonderful friend sent me this read knowing that I was an amature adventure gardener with aspirations to feed my own family from my own garden and plants as much as possible. While my first year was a total flop (and I'm glad I didn't go into the adventure claiming I would only eat food from my yard because I would have starved), it was fun to read how she managed. She also includes a bunch of recipes that I will be trying with homegrown or store bought produce. Except, there is no way in hades I will ever put a snail in my mouth. (Chapter 16) Just sayin'. Also, I doubt I will every own any water foul or chickens. None the less, she does make it seem much less intimidating. I loved the basic gardening info peppered in her story. I learned that I can plant fava beans as a winter crop to replenish the soil with nitrogen. I learned that the dragonflies I see all over my garden area are GOOD for my garden. Also, hybrid tomatoes are resistant to nematodes (which I also learned about) while heirloom tomatoes are not, making them harder to grow. See? A plethora of fun information I tell you! Anyway, easy fun read. Good garden info. I liked her style. Recommend. However, if you couldn't care less about urban gardening, how your food is produced, or geese, you might NOT want to read this one. When I started this blog in 2005, we had preschooler and baby in the house, and oddly, more time on my hands than I do now. Since then we've moved several times, landing in Edmond, Oklahoma; we've started homeschooling our now fourth and first graders; and I've started gardening to the point where I'm beginning to feel like an urban farmer of sorts.